. 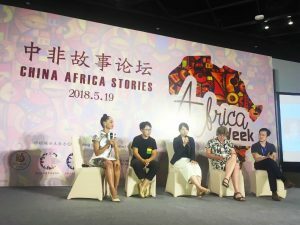 In Beijing, a group of students and young professionals have decided to organise the first ever Africa Week in China – a 9 day program that seeks to instill nuance into public perception and conversations about Africa and China, and to encourage mutual understanding. Development Reimagined is one of the sponsors of the week, amongst others such as OFO, Hotel Jen and many more. In particular, we have supported the sifting of applicants for a start-up competition for new African businesses here in China. The start-up will win the proceedings of the entire week’s events and entry into the Zhongguancun Africa Innovation and Entrepreneurship Center, another key support partner. 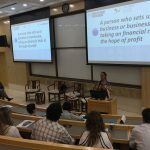 Our CEO, Hannah Wanjie Ryder, also featured as one of the keynote speakers at one of the first events – “China-Africa Stories” and her well-received speech can be found here. At the same event she also moderated a panel exploring opportunities for stronger African and Chinese economics links. The panel featured Zhang Yipeng, who markets and sells South African Rooibos tea in China; Michelle Xiong, marketing director of Guilin Pharma, who export a malaria-treatment drug to 36 African countries that is estimated to have saved over 20 million children’s lives; Shantha Bloemen who has recently founded a social enterprise in Zimbabwe to create and manufacture renewable transport solutions for women, using technology from China; and Joshua Yau, who has advised numerous State Owned Enterprises on their Africa strategies and now works with the Made in Africa Initiative to advise African governments how to set up successful Special Economic Zones in partnership with China. 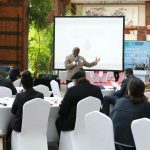 The panel gave their views on the importance and challenges of local, value-added manufacturing in African countries, the potential for importing more high-quality, value-added African products into China, as well as whether and how African and Chinese governments as well as international organisations can encourage such shifts. We are very pleased to support Africa Week, and hope for much more entrepreneurial, joint activity as the year proceeds, especially in the run up to and before the huge, government-led Forum of China Africa Cooperation (FOCAC) to be held here in Beijing in September 2018.